The Photography Business Kit is a collection of valuable resources that can help you to run an efficient and effective photography business. You’ll get several different templates for contracts and forms, templates for 15 different marketing materials, and 10 different logo templates that can be used to give your business a professional image. All of the contracts and forms listed above are provided in both Word format (.doc files) and Photoshop format (.psd files). The Word documents are, in most cases, a little quicker to use. With the Photoshop files you can get a very nice branded look, you’ll just need to edit the logo to meet your needs, or insert your own logo. 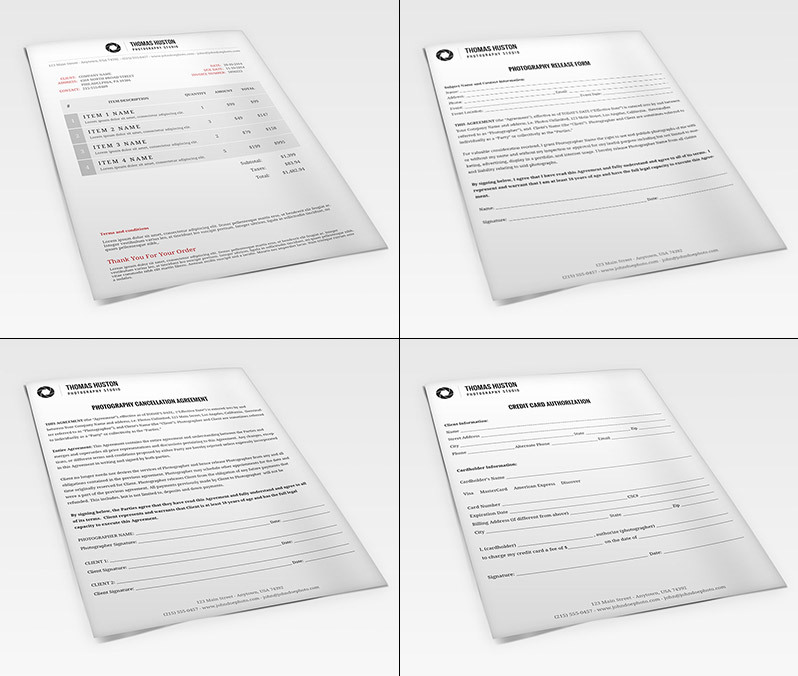 In addition to the contracts and forms listed above, the kit also includes an order form in Word format. You can print the order forms to have on hand and fill them in with your clients when they are placing and order, or give them to clients so they can fill them out and return to you. You’ll just need to edit the details of the prints that you offer and your prices. Many photographers don’t have a professional-looking logo because of the cost of getting a custom logo designed. But with the Photography Business Kit you’ll get a set of 10 different logo templates that you can use in your own branding. Just enter your name or the name of your studio, and if you’d like you can also change the colors. In no time you’ll have a great logo for your business without the need to hire a designer! The logo templates come in layered .psd files and can be easily edited in Photoshop or Photoshop Elements. 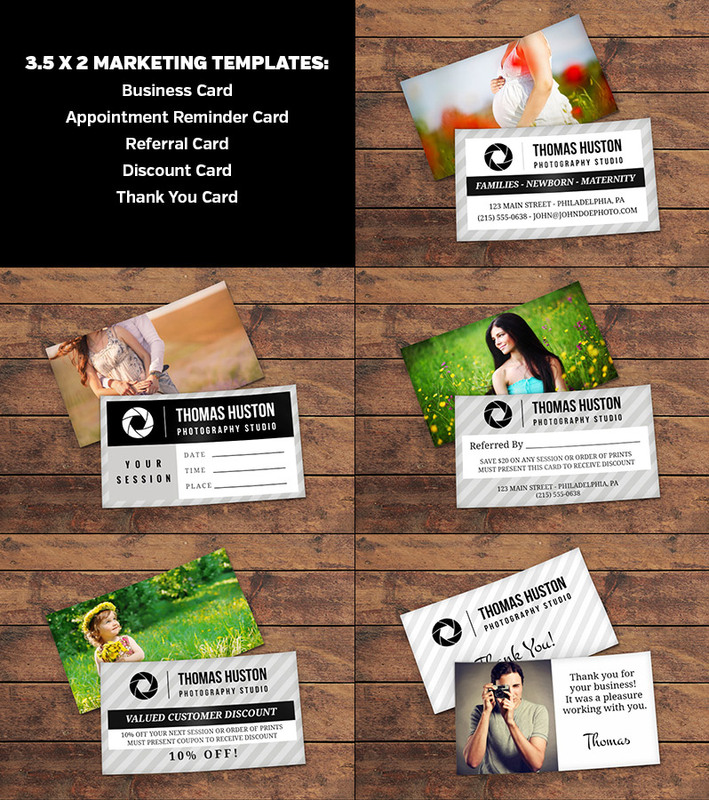 The business card, appointment reminder, thank you card, referral card, and discount card are all sized for 3.5 by 2 inch cards (standard U.S. business card sizes). The thank you card template is for a two-sided card. The others include a front and back for two-sided printing, but they can also be printed as a single-sided card. The back of each simply uses a full-size photo and if you are looking to save money on printing you can elect to only print a one-sided card instead. The 10 mini session card templates are all for single-sided cards sized at 5 inches by 7 inches. Each one uses a different design to effectively present and promote your mini sessions. Just edit the text to suit the details of your mini sessions and insert your photos easily with clipping masks (documentation included). 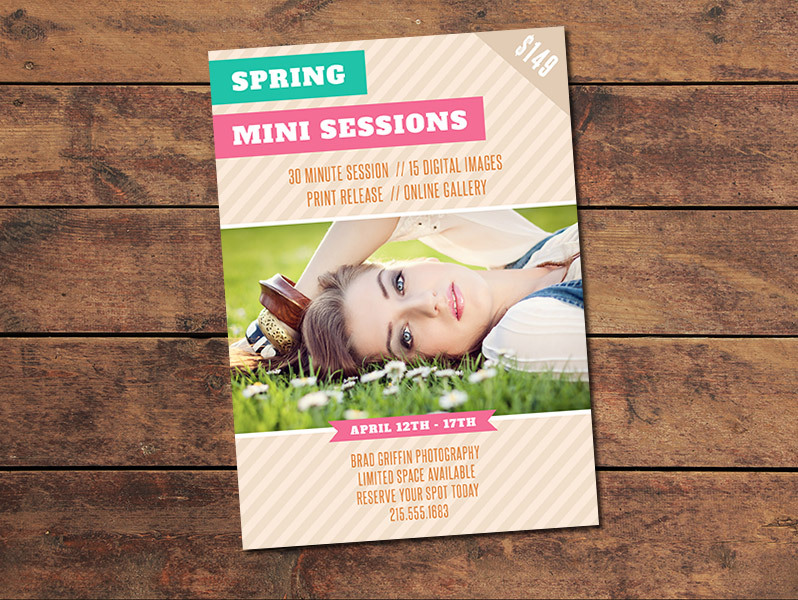 In addition to being printed, these templates are also ideal for online use to promote your mini sessions. You can post them to your social profiles, share them with existing clients, or publish them to your blog. 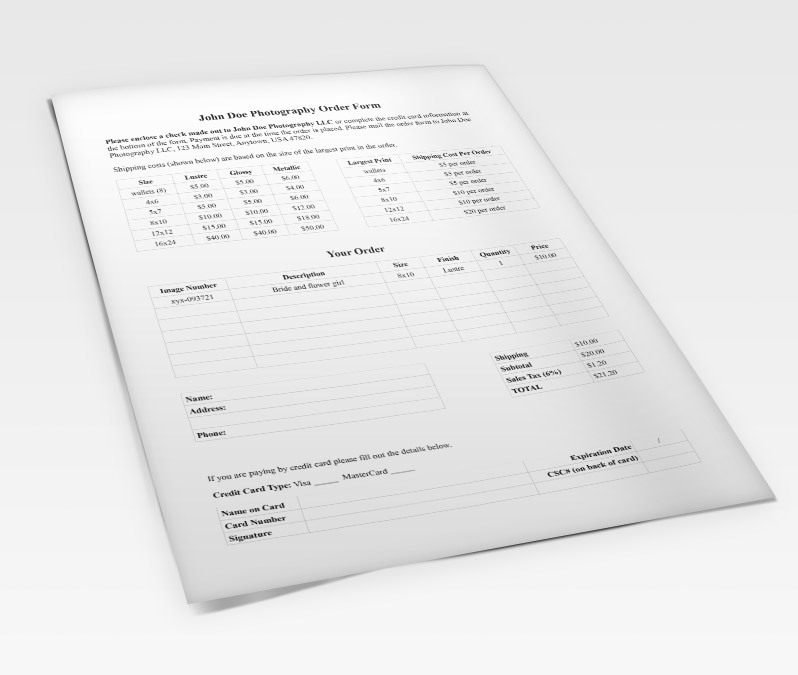 All of the .psd print templates (contracts/forms and the marketing materials) are sized to the specs of Bay Photo Lab. You can use the printer or lab of your choice, but minor adjustments may be needed to meet their specs. Regardless of what printer or lab you choose, be sure to read their specs and instructions for submitting files and make sure that you submit appropriate files to avoid errors in the printing process. Fonts are not included in the download due to licensing and copyright restrictions, but the fonts used are listed in .txt files, as well as the URL where you can download each font. Stock photos shown are for preview purposes only and are not included in the download.